Darwin’s ‘newest attraction’, allows visitors a unique, up close and personal view of massive saltwater crocodiles, crocodile hatchlings, juveniles and the worlds largest display of Australian reptiles. See everything from unique Goannas, Lizards, Monitors and Dragons, along side distinctive Geckos, Turtles and Frogs, as well as rare Pythons, Water Snakes and some of the world’s most venomous snake species. Enjoy the underwater world within our 200,000 litre freshwater aquarium and witness ‘meter long’ Barramundi being fed by divers along with 15 other species of freshwater fish and turtles, all within the city’s CBD. If you can swim (and if you dare! 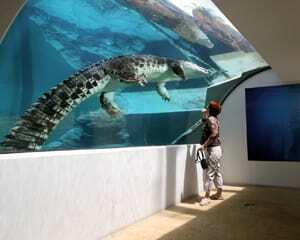 ), bring your bathers and jump into the separate viewing pool next to the crocs enclosure. Not to be confused with the Crocodile Cage Of Death! Click here for more info). This crocodile park is Darwin’s ‘must do’ attraction for locals and visitors. Please note that this entry does not include admission to the Crocodile Cage Of Death! The Crocodile Cage Of Death is available separately, click here to see the experience and current pricing.